MaaS and Intercity Travel – How Will It Work Out? Today there is no clear definition for Mobility as a Service (MaaS). It’s sometimes defined as a subscription-based usage of all available (mostly shared) mobility services. While others see it as a general multimodal user experience where all the different modes of travel are combined to offer the most optimal way to reach your destination. In most cases, the end-users will get an app from the MaaS service provider. It combines, harmonizes and displays the resulting travel options and allows the passenger to pay for the ride (or in the subscription-based model just travel) in a combined payment. The ultimate goal for MaaS would be to replace the need for a personal car, a major goal for congested and growing urban areas. MaaS as a concept is not anything new for the shared transport industry but technical and political or business related obstacles are hindering it. During the last couple of years, there have been clear advancements in the interconnectivity of different stakeholder systems. API technologies are the main reason behind that. Thus technical reasons are not anymore the main excuse for not achieving MaaS. One of the main obstacles towards MaaS concept has been and still is the unwillingness of stakeholders, especially transport service providers, to chip into the MaaS concept. Mainly due to political and economic reasons, for example, the wish to keep the relationship with their customers in their own hands. In the wake of technical advancements, those stakeholders also start to realize that there is less reason to avoid co-operation. There are emerging startups building new technology-driven business models, creating ecosystems to bring those stakeholders together. That paves the way to a new kind of movement. Currently, the key underlying concept of MaaS is that the backbone of the provided holistic mobility services is the already-existing regular public transport network. Other means of transport will be added on top of that service. Yet, the main focus of MaaS concept has been in urban and interurban areas, where the need to reduce private car ownership is the greatest. Thus, a question arises - how would MaaS concept influence and relate to intercity passenger transport industry? This is the way that MaaS is seen currently. From user experience point of view, purchasing urban and intercity travel products are perceived quite differently. Due to short distances in urban travel, lots of services are already bundled together in easily understandable packages. For example, serial tickets. The tickets give the passenger the option to use all the modes of transportation in a certain area within chosen timeframe or number of times (including single ticket). On the other hand, in intercity travel, the distances are longer and the price of a ticket depends on several criteria – demand on different trip segments, fuel cost and competitive situation to name the few. Therefore, the passengers are often researching and taking time to make calculated decisions. This fundamental difference is one of the first obstacles when deploying a subscription-based MaaS concept, which would include intercity travel. First of all, it is quite difficult to predict the prices of intercity travel. Secondly, traveling between cities is usually irregular, based on ad-hoc need. This contrasts with urban travelling, where the passengers consume mobility services as a daily commuter service. So we can say that in the best case scenario, a MaaS provider in intercity travel context would become just another online reseller, like GoEuro or Rome2Rio. The passenger searches for the destination and the system or MaaS platform will make enquiries from different parties. Then the platform presents the results to the passenger. But does MaaS then even affect intercity travel? In our mind it does. The main impact of MaaS movement is foremost on the awareness of intercity operators that times have changed. The more new holistic mobility service providers enter the market, the more operators become to acknowledge that they would need to cater their clients travel needs from door to door, not only from station to station. For example, one of our clients, Lux Express, already offers an option to buy a taxi service included within the bus ticket, thus removing the hassle of purchasing separate services from separate sales channels. In reality, there are some challenges to achieving MaaS in intercity travel. One of the main challenges is not so much the technological integration itself but rather a way to unify and standardize the commercial offer of the different service providers. Let's take as an example the distinct business rules between the companies, who would participate in a multimodal MaaS offer. One mobility provider defines itself as a „low cost“ carrier, thus denying cancellation or refund for any tickets bought. The other says that you can change and return tickets as you wish. Things might get even more complicated should there be any deviation in the schedules and passenger misses the sequential part of the multimodal trip. For that passenger to have any trust in such multimodal mobility service, business rules must be harmonized and covered with fall-back mechanisms. Such harmonization is not something new. In the airline industry, the standardized business rules of rebooking in case of delays or cancellation of previous flight segment, even if not using the same airline, have evolved into multi-layered co-operation frameworks. This is achieved only by long-term co-operation. Similar work needs doing by the ground-based transport providers wanting to participate in multimodal mobility service provision. Another issue related to the multimodal interaction between service providers is related to the technical constraints of the current digital infrastructure of those participating stakeholders. Inventory and reservation systems that so far have been designed and used for every single operator’s own business purposes, notably the legacy ones, have probably not taken into account the rapid increase of request they would need to process after opening up for external systems. Considering that the actual amount of bookings will most likely grow slower or even stay on the previous level, operators participating in such co-operation projects should carefully consider the actual value of every such integration. Certainly, they would need to prepare their digital infrastructure for such task. And last but not least, the organizational difference between the service providers is also a challenge to MaaS in intercity travel. If urban public transport service providers are usually driven by public authority, then intercity travel is mostly operated in private commercial model. Often, these intercity service providers have invested in building loyal client relationships and brand awareness. Although operators might realize that their clients expect intermodal travel experience, it might be more desirable for those service providers to offer such value to their customers themselves. Instead of handing those customers over to MaaS service providers. Therefore, a conflict of interest between MaaS platforms and commercial service providers business goals could ruin the idea of consolidated multimodal passenger experience. Turnit's vision of MaaS as B2B. 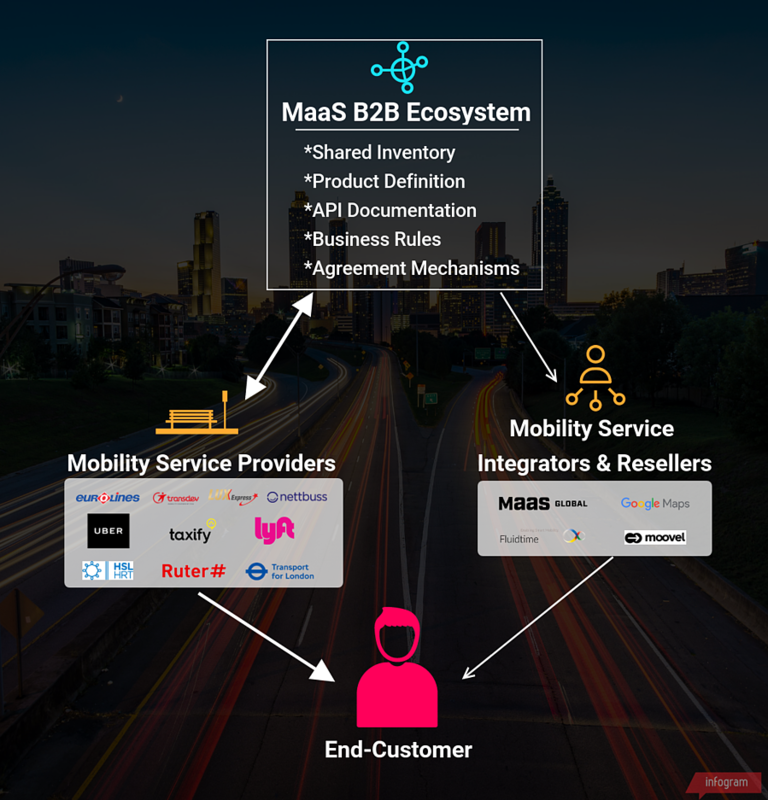 But what if instead of MaaS being „one app to rule them all“, the participating stakeholders had the option to hand pick and combine those mobility services from the joint pool of interconnected providers, which in their mind add the biggest value to their customers? Our vision at Turnit is that MaaS (at least in the intercity travel context) shouldn’t be considered as a B2C but instead a B2B platform. A platform that works as an enabler, a middle layer that enables different service providers, including intercity ones, to enrich their value offer to their clients. Our concept is based on the recognition that the typical purchase process of a long-distance service is considerably more complicated (dynamic pricing, inventory management, seat selection, etc.). 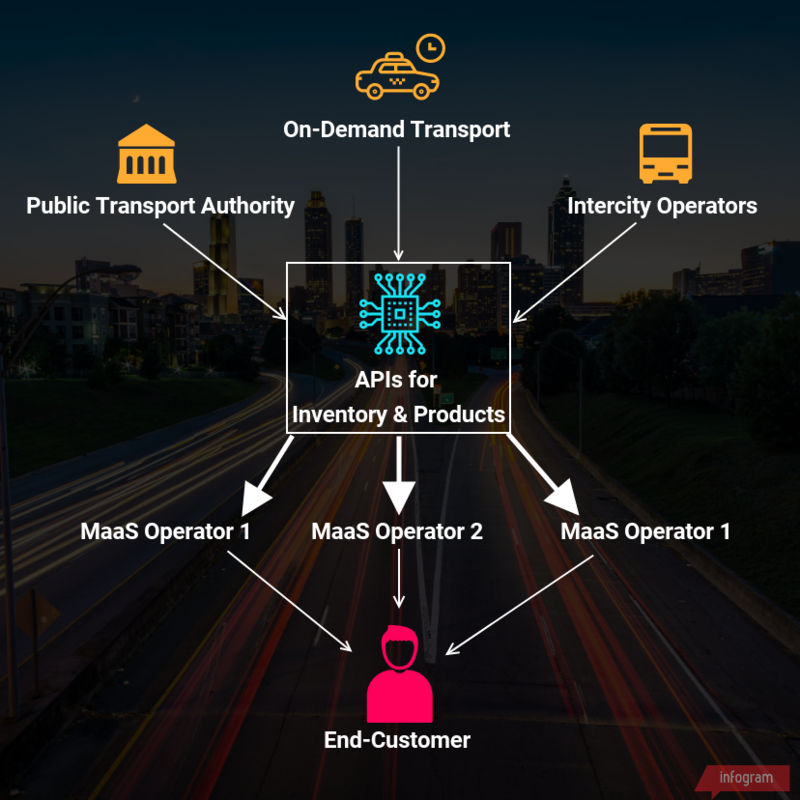 What if instead of MaaS being „one app to rule them all“, the participating stakeholders had the option to hand pick and combine those mobility services from the joint pool of interconnected providers? Thus it might make more sense to integrate simpler mobility services (zone-based public transport ticket or last-mile car-sharing service) to a more complicated purchase process. Instead of trying to bring all that complexity to an app that is mostly meant for daily commuting. We at Turnit propose that MaaS should become something similar to a GDS in travel industry – platform to distribute mobility services in a harmonized market. It would be great to get feedback from current MaaS concept developers themselves as well. MaaS Global, Moovel, Fluidtime, what’s your take on this?